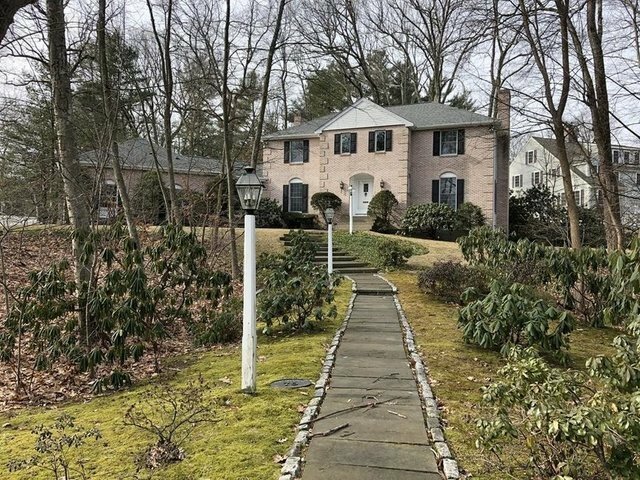 Stately Brick Colonial in the Wellesley Farms/Cliff Estates sought after neighborhood! This lovely home is located on the corner of Ledgeways and Old Farm Rd.Featuring five bedrooms, 2.5 baths, two fireplaces, pristine hardwood floors, an elegant entrance with an open foyer, marble floors, rounded bridal stair case, gourmet kitchen, double oven, wet bar, granite, stainless steel, fireplaced living room and family room, two patios, laundry room, central air conditioning, central vacuum, two-car garage, security, and more... it is a perfect home for entertaining!Just minutes to Wellesley Center, The Farms and Wellesley Hills Commuter Rail and easy access to Mass Pike, Rt 128, Rt 30 and Boston. Inquire with agent regarding a custom build or renovations. If desired, buyer can work with builder on plans.